The official website of the European Team Championship which will be held from October 7-18 in Warsaw, Poland published the composition of the participating teams. Russia will be represented by GMs Alexander Grischuk, Peter Svidler, Alexander Morozevich, Evgeny Tomashevsky, Dmitry Andreikin. The second-ranked team is Armenia which is traditionally headed by Levon Aronian. Then come the teams of Azerbaijan, France and Ukraine which will play without Vassily Ivanchuk and Ruslan Ponomariov. Ukraine is first-ranked team in women's section. Second is Georgia, third is Russia which will be represented by Valentina Gunina, Alexandra Kosteniuk, Natalia Pogonina, Olga Girya and Alexandra Goryachkina. The European Team Championships are starting in Reykjavik today, on November 13, and the participating teams have already been listed according to their board orders. In the open section, Russia, the favourite of the competition, sent Peter Svidler to the top, even though Alexander Grischuk's rating is higher. 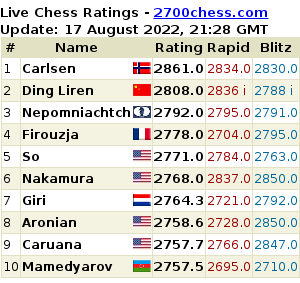 That said, Svidler's, Grischuk's, and Tomashevsky's ratings are really close. The opening ceremony of the Women's World Team Championship was held in Astana, Kazakhstan today. It was visited by FIDE president Kirsan Ilyumzhinov who gave a welcoming speech. Our website plans to cover the event in detail. The website osetiasportivnaya.ru publsihed the list of top-30 rapid players. Let us remind you that such ratings were officially introduced a year ago, however, FIDE still hasn't made a rapid rating list yet. Thus, Ivanchuk has ceded top board in the Ukrainian team to Ponomariov. Two decisive rounds of the women Olympiad today brought up some unexpected news in team compositions. 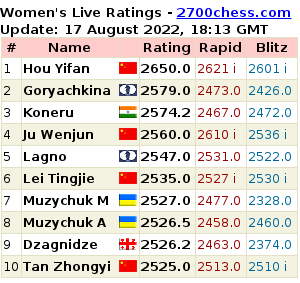 Russia will play against Poland without Tatiana Kosintseva who lost against Hou Yifan yesterday while Chinese ladies will play against Georgia without their second board player Zhao Xue. Gentlemen leading teams of Russia, Azerbaijan and Armenia will have the same players as they had yesterday. Emil Sutovsky is not taking part in the crucial match of the Olympiad’s 3rd round Ukraine vs Israel. Now we can watch live following games of this match: Ivanchuk - Gelfand, Rodshtein - Ponomariov, Volokitin - Postny, Avrukh - Eljanov. Sergey Karjakin (Russia team) is a reserve player in match against Latvia. The most exciting game is expected on the first board: Kramnik - Shirov. Ukrainian and Chinese teams are meeting in the women's tournament.